A Dutch dentist arrested in New Brunswick this week and wanted in France for allegedly mutilating patients will remain detained on several grounds, including that he now says he killed his wife in 2006. A Dutch dentist, who was arrested in New Brunswick this week and is wanted in France for allegedly mutilating numerous patients, says he killed his wife in the Netherlands in 2006. Le Parisien published this photo of Jacobus Marinus van Nierop, a dentist wanted in Chateau-Chinon, France, for allegedly mutilating numerous patients. (Le Parisien)​JacobusMarinus van Nierop, 50, made the admission during an Immigration and Refugee Board of Canada detention review hearing on Friday morning via teleconference. "His statement was … he thought they would want him to return to his country, which is the Netherlands, because he murdered his wife there in 2006," said board spokesman Charles Hawkins. ​"And no one has any information about that, other than he admitted that," he said. Van Nierop, who was arrested in the town of Nackawic, N.B., on Monday, made no mention of his legal troubles in France during the hearing. Considered a danger to the public and himself, given his homicide admission, the violent nature of the allegations against him in France, and an apparent suicide attempt at the time of his arrest. A fugitive from justice in France. In addition, Van Nierop has no status in Canada and failed to leave at the end of his authorized stay He has no fixed address and no financial resources, Hawkins said. Van Nierop, who is also known as Mark, is expected to be returned to the Netherlands. It's unclear whether France will request extradition. If van Nierop is still in Canada within seven days, he is entitled to another detention review hearing. 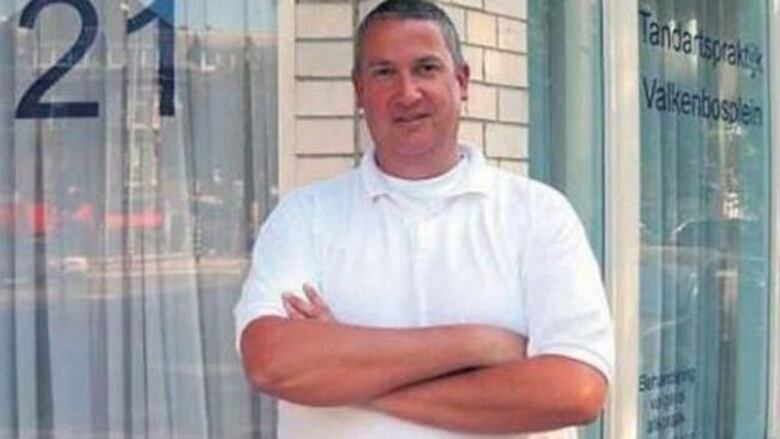 Van Nierop participated in Friday's hearing by telephone from the Southeast Regional Correctional Centre in Shediac, N.B., where he is currently detained under constant supervision. He did not have a lawyer present. He said he would accept a return to the Netherlands and did not object to his continued detention. Canada Border Services Agency officials in Halifax were also on the call, while the immigration board decision-maker was in Montreal. Van Nierop had been wanted in France since December on charges of violence causing mutilation or permanent disability, the immigration decision states. He allegedly pierced some patients' jaws with poorly placed implants, left parts of dental tools lodged in other patients' gums, and pulled out healthy teeth, Europe 1 radio has reported. Van Nierop arrived in Canada on Dec. 18, 2013, and was admitted as a visitor for six months, the immigration decision states. There is no indication that he applied for an extension and none was granted, it says. On Monday, RCMP contacted the Canada Border Services Agency about van Nierop and the existence of a "red notice" from Interpol about him, the hearing was told. The border agency and RCMP officers tracked him down at an apartment in Nackawic, where area residents told CBC News he had been living for about eight months. When the officers arrived, van Nierop was in the bathroom and refused to come out. The officers forced their way in and found him sitting on the toilet, covered in blood. It appears he tried to commit suicide, the immigration decision states. He was taken to the hospital for emergency surgery. During his hospital stay, van Nierop met with a psychiatrist who felt he was not in imminent danger and approved his discharge on Wednesday. Van Nierop had been practising in Château-Chinon in the Burgundy region of France since 2008. Local police started an investigation in May 2013, following numerous complaints from patients. Nicole Martin, president of an association that represents van Nierop's alleged victims, says about 120 people were maimed by van Nierop's dentistry. Of those, about 60 people were seriously injured, she said. An earlier version of this story indicated Jacobus Marinus van Nierop was being detained at the Southwest Nova Scotia Correctional Facility, based on incorrect information provided by the Immigration and Refugee Board. He is actually being held at the Southeast Regional Correctional Centre in Shediac, N.B.